As another year draws to a close, everyone's scrambling to put together their best "best of" list. Time has the 50 Best Websites, Publishers Weekly has the Best Books by category, Ragan has the 10 Best and Worst Communicators, Flavorpill has the Best Debut Novels, Huffington Post has the Best Commencement Speeches. "From entertainers Charlie Sheen and Hank Williams to President Obama and the always-entertaining GOP presidential field, here are our choices for the most memorable language moments of the year." A Writer's Life. Over on Thought Catalogue, video-game journalist Leigh Alexander has a comprehensively sardonic explication of the joys and horrors of being a freelance writer. Covering things like how much to drink, how long to wear that pair of sweatpants before shudderingly tossing them in the hamper, and which things conspire against you to make you miss yet another deadline (hint: Facebook), "How to Be a Freelance Writer" lays out all the aspects of the writing life that most of us don't really want to admit to. iNovel? According to MediaBistro (who heard it from Good E-Reader), next month Apple is probably going to unveil new self-publishing software, which will compete with Barnes & Noble's PubIt and Amazon's Kindle Direct Publishing platform. No real details are known yet, but this could be a big deal for aspiring authors, offering yet another way to get your book out into the world. Worst Line of the Year. Our friend David Murray has selected his contender for the "clunkiest, clankiest, junkiest, stankiest" line from a speech in all of 2011. Want to know what it is? Click over to Vital Speeches of the Day. Out With the Old. One more end-of-year wrap-up: Kirkus presents their choices for best book covers of 2011. But lest we dwell too much in the past, here's Flavorwire's ten most anticipated books of 2012. The list includes yet another Bolaño, Adam Levin's first short story collection, and Chip Kidd's graphic novel about Batman (!). What books are you looking forward to this year? Tell us in the comments. 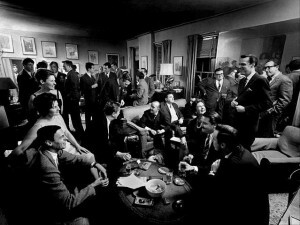 Last night, Gotham Ghostwriters had our annual holiday gathering, where we invite our writer friends out to meet one another and share stories and drinks. It was a lovely gathering of fascinating people, and for two writers, it was something even more amazing. Here's the story, by incredibly prolific ghostwriter Kerry Zukus. You can read the original post on his blog. The Fourth House, my Book of the Month Club Feature Selection debut novel, took place in the fictional town of Mountain City on the fictional street of Good. Like many novels, not all of it was purely fiction, but was inspired by real events and places in the author’s life. The protagonist's house was modeled after the house in which I was born. Unlike the main character, I didn't live there for my entire childhood, but moved—was forced to move—when I was three years old. Like the main character, my father abandoned my mother and me, forcing us to sell the house and downsize to a small apartment in the same town. Change, like the loss of a father and the only home I’d ever known, is disconcerting for a three-year-old. One of my oldest memories is of the day of that upheaval. We’d finally moved into the apartment and were all relaxing at the kitchen table. My grandfather was a quiet man of few words, but when he spoke he made it count. Sensing my mood, he turned to me and quietly said, “Everything’s gonna be all right.” Cliché, I know, but profound and beautiful in its simplicity, for it covered any and all anxieties I was feeling. Everything’s gonna be all right. And it was. We sold our house to the Davis family, who had a girl, Colleen, a year younger than I. Ironically, the Davises lived in the apartment we procured. Essentially, we traded houses; them moving up, and us moving down. For no logical reason, we became good friends with the Davis family, but after high school graduation, I never saw any of them again. I can say that about a lot of people from Mountain City. I left and hardly ever looked back, so the onus is on me. Last night, I went to a party in New York hosted by Dan Gerstein and his company, Gotham Ghostwriters, with whom I occasionally work. It was a nice crowd, and a good time was had by all. I milled about the room, talking to old colleagues and meeting new ones. Toward the end of the night, a small blond with cupid lips approached me and said, “I hear you’ve written a lot of books,” which, as a ghostwriter, I have. We began talking about writing, about education, about a plethora of subjects. It was nice. At the end, as with all previous conversations I’d had that evening, we exchanged business cards. She got mine first. Simultaneously, we wrapped each other in the biggest bear hug I’ve shared in a long, long time. I’m a writer. Colleen Davis is a writer. We both work with Gotham Ghostwriters and we both attended that one party on that one night, of all the holiday parties in the world. And neither of us had any idea of any of this up until that very moment. Maybe there were and maybe there weren’t. But two ghostwriters did live there, one after the other. Hey Dan, thanks for inviting us to your party. Can’t wait to see what surprises next year’s will bring. Our regular look at the amazing writers we know. One of the most flexible, diverse writers on the publishing landscape, Alan Goldsher is at home in any genre, in any style. Whether it's a horror novel, a romantic comedy, a comedic memoir, or a poignant autobiography, Alan can bring any book project to life. He is the author of the acclaimed remix novel Paul Is Undead: The British Zombie Invasion, as well as several forthcoming titles (four lined up for 2012! ), including Give Death a Chance: The British Zombie Invasion 2, My Favorite Fangs: The Story of the von Trapp Family Vampires, How I Slept My Way to the Middle: Stories and Secrets from the Stage, the Screen, and the Interwebs (in collaboration with comedian/actor Kevin Pollak), and Miles Davis FAQ. He has written nine other books, including Hard Bop Academy: The Sidemen of Art Blakey and the Jazz Messengers, Midnight Movie (with director Tobe Hooper), Modest Mouse: A Pretty Good Read, The True Naomi Story, and No Ordinary Girl. As a ghostwriter, Alan has collaborated on projects with dozens of notable celebrities and public figures. Prior to taking the writing world by storm, Alan spent 10+ years as a professional bassist, during which time he recorded with Janet Jackson, Cypress Hill, and Naughty by Nature; toured the world with Digable Planets; and performed at the 1994 Grammy Awards. GG: What led you to become a ghostwriter? AG: I'm a storyteller, and if I can help a non-writer tell their story—be it a memoir, a novel, some narrative non-fiction, whatever—that's a beautiful thing. Also, there's something to be said for writing as part of a team. Writing is a solitary profession (fiction, especially), so being part of a group-think is a nice change of pace. What's the most unusual writing project you've done? I can only pick one? Hmm. I helped a Haitian doctor write his memoir, but he wouldn't tell his full story because he was afraid that Papa Doc's family might track him down and murder him. He was a lovely man, but a little nervous. And then there was the angry, angry stand-up comic who... Well, we'll go over that one another time. What's the most difficult part of being a full-time writer? I'm all over the map, but if you had to pick a common thread, I guess you'd have to say I'm a pop-culture dude. Hip memoirs, sports books, film books, cool fiction, horror, that sort of thing. On my website, Facebook, or Twitter. Publishing house of ill repute: What do you think of Amazon's reputation as a publisher? GalleyCat took a look at the retail giant's rep at their Publishing App Expo last week after an audience member asked if the publishing community looked down on Kindle authors. Though some consider collaborating with Amazon to be selling out, others see a great opportunity for exposure, since Amazon has the largest share of the e-book market. The perfect platform: Finding the right angle or hook to sell your book can be tricky, but agent and blogger Rachelle Gardner has some tips on building the right platform for your work. Check out her post on ways to leverage your expertise into a strong selling stance for your nonfiction writing. Bro books: A new online site selling books geared toward guys seems like the perfect solution for those who are stumped about what to get their brothers and boyfriends for the holidays. But the Man Cave pop-up bookstore has let some word nerds down by focusing on titles like How Do You Light a Fart? and Sweet 'Stache: 50 Badass Mustaches and the Faces Who Sport Them. For slightly more sophisticated titles for the manly man in your life, check out this article by the Utne Reader. Viral visuals: Getting your content to "go viral" can be an elusive challenge, but ProBlogger has broken down the task with this fun infographic. Check out this visual guide to writing killer content, connecting across platforms, and encouraging sharing. Self-pub superlatives: Highlighting the recent trend of self-published authors striking it big, the Wall Street Journal ran a story on best-selling author Darcie Chan today. Like other self-pub standouts, Chan had a great novel but no publisher. She turned to e-books to find and outlet for her work and has sold 400,000 copies, putting her on par with other successes like Amanda Hocking and John Locke. A showroom of one's own: We wrote earlier this week about a recent poll finding that 24 percent of online book buyers purchase a book after seeing it in a brick-and-mortar store first, a practice referred to as "showrooming." In Time magazine this week, Emma Straub, a bookseller at Brooklyn's BookCourt, gives her two cents about this alarming trend. Though Amazon offers access to books for many people who aren't lucky enough to have a local bookstore, Straub takes issue with people who use BookCourt as a showroom. "We’re talking about the people who do live close enough to independent bookstores to stroll their aisles," Straub writes. "Because this story is about those people selling the bookstores out for a better deal." What do you think? Are showroomers soulless or just savvy shoppers? Vital visibility: Online writers often struggle with a difficult challenge: how do you make your writing audible over the noise of the rest of the Internet? Author and content marketing expert Rebecca Lieb gave an illuminating interview to GalleyCat with tips on how to make your work stand out. For example, she says that writers have a leg up, given that search engines traffic in the written word. What tips do you have for writing attention-grabbing content? Greatest gobbledygook: The Plain English Campaign is on a mission to end pretentious jargon and confusing public communication in the UK. This year, the organization has awarded the UK's Meteorological Office their Golden Bull "booby prize" for the worst offense in public discourse: The Met Office began predicting "probabilities of precipitation" instead of the chance of rain last November. The Plain English Campaign describes their motivations to the BBC: "Even though most people agree that plain English is plain common sense, our government needs to make it a legal duty that public communications are crystal-clear." Do you agree? Today's guest post is from author, editor, and speechwriter Brooke Stoddard. His latest book is World in the Balance: The Perilous Months of June–October 1940. Find him online at Archon Editorial. One of the premier events in the Washington, D.C., literary year is the annual National Press Club Book Fair and Authors' Night. In addition to being an enjoyable social event, the Book Fair raises money for the Club’s Eric Friedheim National Journalism Library and the SEED Foundation, which educates at-risk youth. Eighty or ninety authors sit behind a table stacked with their books and make themselves available to chat with Club members and the public strolling by. The books on display are selected by a committee of the Club, and all have all been published within the calendar year. There are books from a broad range of genres, including business, history, politics, food, children’s, lifestyle, literature, memoir, and sports. I’ve been a member of the Club for years, and I attend the Book Fair whenever I can, but this was my first time “behind the table.” It was a delightful time. I got to rub elbows with fellow authors Ron Suskind, Ann Coulter, Jim Lehrer, John Farrell, Joe Lieberman, and dozens of others. My publisher, Potomac Books, sent a stand-up foam board of the cover of my newest book, World in the Balance, and Barnes & Noble supplied stacks of books for me to sell and sign. I was in good company, surrounded by Laurence Bergreen (Columbus: The FourVoyages), Stanley Weintraub (Pearl Harbor Christmas), and Marvin Kalb (Haunting Legacy). Not having had the publicity or the renown of some of the other authors, I expected the space in front of my table to be relatively calm, but I was mistaken. Shoppers, many looking for holiday presents, stopped by in a fairly continuous stream, sharing stories, asking questions, and happy to buy. Some bought multiple copies; four was my record. I signed books eagerly and wished good reading to all. C-Span sent a crew to tramp the floor between tables, and they interviewed a number of authors, TV camera lights flashing when an author was ready. I was interviewed for a few minutes, although I have yet to see any results. Next year will be a whole new crew because not many authors publish a book within twelve months of the last. Not having planned a tome for 2012, I will still be at the Book Fair next November -- but on the consumer side of the tables. In defense of adverbs: Though Stephen King said, "The road to hell is paved in adverbs," one writer is coming to the much-maligned part of speech's defense. Atlantic writer Lily Rothaman argues that many famously, fantastically memorable phrases would be duds without adverbs -- would we "give a damn" about Rhett and Scarlett without "frankly"? Where do you weigh in on the adverb debate? NYPL woes: The New York Public Library has been a vital resource for scholars, writers, and readers in NYC for over 100 years. But with budgets tightening and a large renovation planned, the library is in an unprecedented state of upheaval. Check out the Nation's in-depth article on the changes at America's largest library. So-so sentences: Is "so" the new "um"? That's the question the Chronicle of Higher Education's Lingua Franca blog is asking, after the New York Times pointed out a pattern of starting sentences with "so" earlier this year. Microsoft employees take credit for starting the "so" phenomenon, but its been picked up by everyone from politicians to NPR (a chronic offender). What do you think about this connector-turned-sentence starter? Is "so" so over? For the policy wonk who has everything: The gift-giving season is upon us, and you might be debating which books to put on your shopping list. The Guardian has compiled several different lists of the best books to give in 2011, but our favorite is the list of political books. From manifestos to biographies to political thrillers, you're sure to find something on this list for the current events connoisseur in your life. Cure for your shopping hangover. How was your Black Friday? We hope you didn't get trampled, looted, or pepper-sprayed. For those who stayed home—or those who wish they had—Huffington Post has a list of dystopian novels that seem rather apropos. As Madeline Crum says in the article, "What would Aldous Huxley or Ray Bradbury have to say about a society willing to fight for 40% off a dress or a complementary tote? Or did they already say it in their books?" The tweeting gene? The Guardian has started a new series where science writer Anna Perman deconstructs a complicated genetic theory for us lay-readers. The inaugural post is about the gene FOXP2, which is responsible for communication. It affects many different animals; a mutation on the gene in a human leaves the person with dysphoria, and "knock out this gene in birds and they have problems with – well – tweeting." Famous rejects. Rejection letters are a fact of life for any writer, no matter how famous. Don't believe us? Check out Flavorpill's compilation of some of the harshest rejections in history, send to luminaries like Gertrude Stein, Vladimir Nabokov, Kurt Vonnegut, and more. From GG's president @DanGerstein, continuing the bird theme: "The Maltese Falcon Flew Over the Cuckoo's Nest to Kill a Mockingbird." From our associate Oriana, "The Devil Wears Prada in the White City of Glass," and, via her Brooklyn blog @brooklynspaces: "A Tree Grows in the Last Exit to Motherless Brooklyn." From our writer friend @kerryzukus: "Rich Dad's Chicken Soup For Dummies." We're starting a new regular feature here on the BloGG: Writer Profiles! As you can imagine, Gotham Ghostwriters knows a lot of writers, all of whom are working on exciting projects. If you're wondering what goes on in a writer's head on a typical writer's day, this series will give you some insight. Our inaugural profilee is longtime GG friend and writer Erin Martin, a former reporter for the Hartford Courant and deputy press secretary to U.S. Senator Christopher J. Dodd of Connecticut. A graduate of Stanford University, Erin has managed political development programs in post-apartheid South Africa and Namibia. She also worked for The September 11th Fund, a World Trade Center relief organization, and for a Madison Avenue communications consultancy. She lives in New York City. GG: What's a typical "writer's day" for you? EM: The only certainty in my day is that first cup of coffee. After that, it all depends. Thankfully, no two days are the same! GG: What's the most rewarding writing project you've done? EM: As someone whose livelihood depends on versatility in writing, I try to find something rewarding in every project. I don’t ever want to feel that I’m writing something for the paycheck, or that the final product doesn’t matter to me. Not caring about the project = poor product and bored writer. That said, the most rewarding projects have been ones in which I felt that my writing captured the essence of a person, place, or situation. Two leaders in that category are the newly released Fit to Serve, the book I did with Jim Hormel, America’s first openly gay ambassador, and another memoir I did through Gotham, a rags-to-riches story about a Bombay woman who came to the U.S. and made a fortune in radiology. I support my writing habit with short-term communications consulting. Interesting recent gigs included a project in Bosnia to promote intellectual property rights, and another in Kosovo to explain and drum up support for the country’s new tax system. What's the toughest thing about being a writer? Discipline. The tiniest of writing roadblocks can prompt my socks to yell from their drawer, demanding re-organization, or cause cookbooks to throw themselves off the shelves and open to a must-make-this-tonight recipe. What are some great writer resources you depend on? I used to find inspiration in hearing authors discuss their work, until one afternoon at Lincoln Center I heard a Peruvian short-story writer counseling artists to cancel their magazine and newspaper subscriptions, cut off their cable television, and shut themselves off to all outside voices. His suggestion was extreme, but the ideas of eliminating extraneous chatter and looking internally for guidance appealed to me. What that means, I guess, is that I strive to let my own voice be my number one resource. Novel dysfunction: If the prospect of spending Thanksgiving with your family makes you feel less than grateful, consider turning to some literary inspiration for dealing with dysfunctional families. In honor of the holiday, Ploughshares Literary Magazine put together a list of the books about the darkest, craziest and unhappiest families. What's your favorite book about family feuds? Fired up: Amazon's newest e-reader -- the tablet-style Kindle Fire -- has finally arrived, and the reviews are lukewarm. Slate technology writer Farhad Manjoo gives his take on the Fire, characterizing it as "underachieving" but priced low enough that it could successfully compete with the iPad. Manjoo also predicts that the Fire will lead to even more book sales than previous Kindles. Will you be buying a Fire this holiday season? Unreasonable lending? In other Amazon news, the Authors Guild is pretty unhappy with Amazon's other new feature: the Kindle Owner's Lending Library. The AG issued a statement arguing that the lending library falls outside the realm of most publishing licensing contracts. They also have some tips for getting your book taken out of the library if it's there without your permission, GalleyCat reports. Is the Lending Library a good thing for authors, or a backhanded move by Amazon? Best of the web: As any web-surfing word nerd knows, there's tons of writing advice on the Internet -- some of it good, and some if it not so good. Over at the Writing Resource, Erin Brenner compiled a list of her favorite advice on the writing process, from getting started to keeping your readers' attention. Do you have an article on writing that you refer to again and again? Book rebellion: Bibliophiles were shocked and appalled when the police officers dismantling the Occupy Wall Street camp at Zucotti Park confiscated the "People's Library" of over 5,000 books. But Jeremiah Moss, a blogger and author who writes about New York, believes that this kind of high-profile destruction could be just the publicity that books need to combat their old-fashioned image. Despite what ebook retailers and gadget-o-philes will have us believe, he argues, print books aren't fusty, they're revolutionary. "Seeing large numbers of books together in one place has the power to stir emotions," he writes. "And the People's Library was this kind of powerful place -- not virtual, but real. E-readers like the Kindle do not have this power. They don't burn and therefore do not, by the spectacle of their burning, shock us into action." Publishing faces the music: The music and publishing industries have gone through similar changes due to the digital e-volution. Both music and books have seen an increase in digital sales, a drop in digital prices and a slew of piracy problems. To investigate what each industry can learn from the other, FutureBook has created a four-part series on the digitization of books and music, written by experts who have worked in both industries. Do you think the comparison is apt? Ye olde sociale networke: Though we often feel like we're in a time of unprecedented change for communication and technology, Stanford professor and language blogger Cynthia Haven points out that the 17th century was also a time of expanding social networks. The postal system allowed people to communicate like never before, and there was even a Twitter-like trend of scattering bits of paper with revolutionary poems written on them throughout the streets of Paris. Check out her article if you need some inspiration to stay on top of your social media strategy. If Voltaire wrote 10 to 15 letters per day, you can surely send out a few 140-character Tweets. Give the gift of literacy: Even though it's not even Thanksgiving yet, the holidays are looming. And since that means beginning to think about gifts, GalleyCat has compiled a list of ten charities that promote literacy and reading. These organizations provide books to those in need throughout the United States and around the world. Do you have a favorite language-loving charity that should be added to the list? Tell us in the comments. When Ragan wrote about the top ten intensifiers you should absolutely, positively avoid, we were inspired to ask our writers for their opinion. As the results from an informal poll of our Facebook network show, "awesome" is by far the most annoying adjective. Alan Perlman, a writer in our network with a PhD in linguistics, had this to say about intensifiers: "Adjectives and intensifying adverbs both tend to weaken in meaning and are progressively replaced by stronger terms. Some people over-rely on 'really' or 'literally,' as if everything else is imaginary." 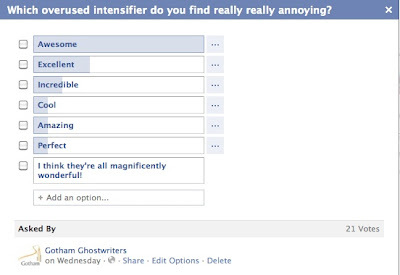 Other finalists for most annoying intensifier included "excellent," "incredible" and "cool." Writer James Buchanan made a convincing case for "interesting" and "interestingly" as well: "As I have learned, merely saying something is interesting does not make it so or do anything to denote why." But author Kerry Zukus warns us about dismissing intensifiers out of hand, reminding us that "they are all fine for dialogue. Flesh-and-blood people use them in speech all the time, and I hate it when writers have Average Joes speaking as if they've just completed Finishing School." Didn't get to vote in the poll, but want to add your two cents? Leave your nominations for worst intensifier in the comments. Empire state of publishing: Would the rest of America buy more books if the publishing industry wasn't so concentrated in New York? Publishing Perspectives has posed that question, holding that the Manhattan- and Brooklyn-based publishing world can be too insular and self-referential. As they put it, "How many novels can someone in, say, Chicago or Atlanta read about a twenty-something Manhattan editorial assistant, junior Wall Street trader, or cupcake shop owner in Cobble Hill looking for love?" Going up! Every professional word nerd knows the importance of the "elevator pitch." But in our increasingly digital work world, what if you only get to pitch over email or on your website, rather than in person? Don't worry: Men With Pens has some tips for making your pitches shine in the virtual elevator. Tweet police: Twitter has become a minefield of potential ethical problems that writers have to navigate daily, especially journalists, for whom a misfired tweet can ruin your reputation, or even cost you your job. The AP recently released their social media guidelines and have turned their attention to retweeting -- as reported on 10,000 Words, journalists are advised to avoid retweeting anything with an opinion to avoid the appearance of endorsement. When it comes to social media, how objective should we expect journalists to be? Writing the Occupation: Occupy Writers -- an offshoot of the Occupy Wall Street movement -- has collected over 2,000 signatures and stories from writers who support the protest. Mediabistro interviewed Occupy Writers co-founder Kiera Feldman, who says they eventually hope to publish the responses they have collected. Will you be adding your voice? Democra-tweets: Did you ever think your tweet could be read on the floor of the House of Representatives? Rep. Maxine Waters of California combined crowdsourcing and speechwriting to achieve a public-speaking first: she crafted a speech entirely from tweets and Facebook posts from her constituents. Head over to the Eloquent Woman to hear Walters deliver the speech. Kick the habit, pick up a book: A couple of quirky publishers and designers are hoping books can be just as addictive as nicotine. According to Publishing Perspectives, German publisher Automatenverlag has repurposed cigarette automats to distribute books instead of cigarettes in the neighborhood around the University of Hamburg. And a UK design magazine has created miniature books that fit into cigarette packs. What's next? Cigars that turn out to be rolled-up newspapers? Ay, there be pirates! With the rise of e-books, authors -- like musicians and filmmakers -- have become vulnerable to pirates roaming the high seas of the Internet. Fortunately, agent and blogger Rachelle Gardner has thrown you a life preserver in the form of a primer on Internet piracy. Have you ever found an illegal copy of your book floating around? What do you do to prevent piracy? Ghost busting: MSNBC's Chris Matthews is not known for pulling his punditary punches, and this week he threw a couple haymakers that got a few ghostwriters' hackles up. In an interview with Forbes this week about his latest book on JFK, Matthews took umbrage at a question about whether he had any outside writing help -- with a more strongly-worded version of "Forget you." Matthews treated the insinuation as an attack on his character; "It’s amazing to me that you think I’m some lightweight, glib bulls**t artist that has somebody do his work for him," he said. Though we can appreciate that Matthews takes pride in his writing, attitudes like this perpetuate the stigma against ghostwriters and keep other experts from admitting when they've needed some professional help. What did you think? Keeping up with the Kindles: Amazon announced its new Kindle Owners' Lending Library this morning, a service available to Kindle-owning Amazon Prime members. Members can download and "borrow" one e-book per month, keep it for as long as they want and then replace it with a new borrowed book when they're finished. The impact of this move is being hotly debated in the publishing world, and some speculate failure since none of the six largest publishers have signed on, according to the Wall Street Journal. But others see it as an opportunity to hook readers with a free book and then sell them other works by the same author or publisher. Is this what libraries will look like in the digital age? Show your books some love: While spring may be the traditional time to clean house, fall is a great time to care for your books. New York Public Library conservationist Shelly Smith recently shared some easy tips for keeping your home library in top shape. Stable temperatures, regular dusting and avoidance of too much moisture and light are all necessary to make sure your books last a lifetime. Publishing's manifest destiny? The Books in Browsers conference in San Francisco last week provided a valuable window into where technology and publishing are headed, according to a review by Publishing Perspectives. BIB11 was more focused on the high-tech UX (that's "user experience") than the traditional publishing elements -- "the words author, editor, agent, story and narrative were sparsely used." But the overall outlook for the future of books (or rather, e-books) was sunny, and perhaps showing the conference's geographic tilt, moving westward. Check out the postmortem and let us know what you think. Is the balance of publishing power shifting to Silicon Valley? E-wards: Have you written an e-book that you think is award-worthy? The Global Ebook Awards -- the brainchild of e-book advocate Dan Poynter -- are now accepting entries in fiction and non-fiction. All entries get a sticker for the cover of their book, and winners get a free listing in Publishers Marketplace as well as other exposure for their e-book. Will you be entering?